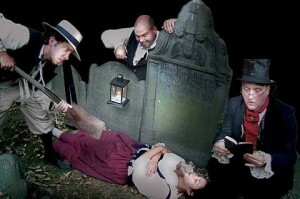 Ghost Tours of Boston, Savannah, St Augustine, & Key West BLOG » Blog Archive » Is the ancient city haunted? You be the judge. Do you believe that St. Augustine is haunted by spirits from centuries ago? I had heard from others that the ancient city has had its share of supernatural occurrences, but I was interested to find out for myself if any of these tales had merit. On the Ghosts & Gravestones Tour of St. Augustine, you get to visit some of the city’s most popular haunted spots and hear accounts of ghosts and other paranormal activity. The Spanish Military Hopsital is one of St. Augustine‘s creepy-est attractions in my opinion. It’s a fascinating place as far as historical significance, as this was the hospital during the Spanish Occupation of the late 1700’s, early 1800’s. You can see the surgeon’s room and tools they used during that time period, the mourning room where the final prayers were said before the patient passed, etc. What spooked me was the Gravedigger Guide’s narration about the way they treated patients back then, really horrible amputations and more. They say that some of the people who died in that hospital never left and are haunting the place. One of the people who was on the tour with me swore she heard a faint noise that sounded like someone crying for help. I was so glad I did not hear that! Although I would have liked to return home and report a supernatural experience. Another great sight on the tour was the Old Jail. I had a good laugh when we stopped here because my 8 year-old, who was not on the tour, was adamant that I not take him there at any time! Something about the place just freaked him out! When the Ghosts and Gravestones Tour stopped there it was a little eerie, but then it was dark and we were looking for spirits of the undead! This part of the tour was fun because we heard about some of the prisoners of the past and looked for clues for the book of the dead. We also stopped at the Old Drug Store and drove past some of the local St. Augustine Cemeteries. If you like this kind of thing, you’d have a ball because the whole tour is focused on long-lost souls and how they still live where they died, just on the other side. The Hugenot Cemetery is where many of the people who died from Yellow Fever are buried. Our guide told us that guests on the tour have reported seeing weird and unusual sights there. I kept my eyes out for ghosts the whole time but did not actually see one. Maybe next time! One of the greatest aspects of this St. Augustine tour was seeing some of the most historical sights and learning the background of the places and the original settlers to the area. I have taken many other tours when visiting St. Augustine, but the Ghosts & Gravestones Tour offers a whole new perspective on the city. This entry was posted on Thursday, August 21st, 2008 at 9:18 am	and is filed under St Augustine Ghost Tours. You can follow any responses to this entry through the RSS 2.0 feed. Both comments and pings are currently closed.